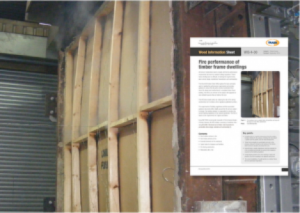 The effects of fire performance on cladding is just one of the revisions in TRADA’s updated Wood Information Sheet, Fire performance of timber frame dwellings. The popular WIS has been updated and now references building regulation limits on the use of combustible cladding and requirements for surface spread of flame (reaction to fire) performance for cladding adjacent to boundaries, as well as rules limiting the size of ‘unprotected areas’ on elevations near to boundaries. Unprotected areas include windows and combustible cladding. The allowable amount varies with the distance from the boundary and height above the ground. Rules for calculation are included in national building regulations. It is also necessary to control the potential for the linings of walls and ceilings to contribute to a developing fire, as well as to contribute to meeting the specified periods of fire resistance for the elements of structure of the building. The current normal requirements for low- and medium-rise buildings are 30 and 60 minutes’ fire resistance respectively. Plasterboard is the most commonly used lining material due to its economy, ease of working, and good fire performance.